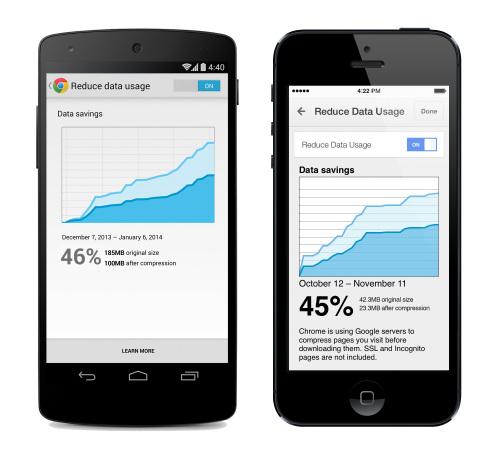 Google are set to release an update on Chrome for Mobile, which promises to decrease data usage when browsing by up to 50%. With more and more people using their smartphones to browse the internet, the new feature on Chrome is brilliant news for users who will benefit from reducing their data usage by saving money. To access the new changes, just go to “Settings” > “Bandwidth management” > “Reduce data usage” and turn the toggle to “On.” From here, you can see just how much bandwidth you’re saving each month as you browse. As part of a series of changes on Chrome, iOS mobile and tablet users will now be able to access Google Translate, simply with the touch of a button. For Android users, you will now be able to add shortcuts to your frequently visited webpages, for faster access and easier navigation.